Cold climate orchids are sought after in the UK and Pleione Orchids are from the foothills of the Himalayas, from India through to China. The naturally grow on the forest floow amonst the leaf litter, so a humus rich well composted soil will work well for all species. A wonderful easy care plant for the UK, Pleione Orchids are a cool climate orchid and when growing in the home are generally grown in pots or containers except in milder areas where protection from extreme frosts can be given. These Orchids like a cool winter dormancy and a warm summer (avoid extreme heat). A frost free position is essential if growing outside. Pleiones are a semi epiphytic orchid that grow naturally on higher slopes usual on rocky outcrops in wooded areas. These lovely orchids are readily available for sale from online mail order nurseries. 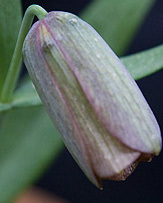 The flowers emerge from a pseudo bulb in spring, shooting up to nearly 20 cm in heigh depending on the growing conditions and the variety. As the flower fades the foliage takes over and lasts well through summer. Unlike many other orchids only a small number of hybrids are avaioable, however a few dedicated hybridizers in the UK and Europe are producing new varietes. Thriving in a cold winter, which makes them great for UK, Pleiones do not like temperatures above 25C so some protection on hot days is needed. In terms of light, light dappled shade is best, direct sun in summer should be avoided. Consider that the natural environment is a rocky outcrop, they actually seem to prefer to have roots growth restricted, as long as it is cool, so avoid over potting. 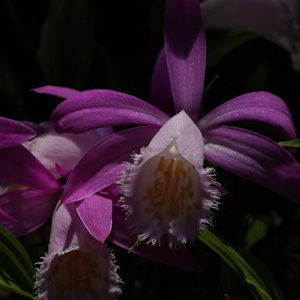 Pleiones like to be moist during the spring - summer growing season and should be allowed to dry out during the winter dormancy. An all purpose liquid orchid fertilizer applied in spring seems to be sufficient. With literally 100s of hybrids available and with new flowering forms released each year a great way to keep up with new introductions is to attend Orchid Shows, you will be amazed at how many amateur growers are producing new forms and colors every year. Pleiones require repotting every year or second year, but not to big a pot. Generally January to February are the best time to repot Pleiones. Use a free draining orchid potting mix available from most good nurseries or make your o wn using a 10- 3 - 1 mix or orchid bark, perlite and sphagnum moss. They do like an alkaline soil, so some lime may be needed depending on the potting mix or soil structure. Fertilizer is a must with Pleiones, they are hungry plants and a high potash content type fertilizer works well. Apply this from flower shoot until the foliage begins to die back in autumn, every 4 - 6 weeks seems adequate. Many growers use neem oil to protect the bulbs from insects. 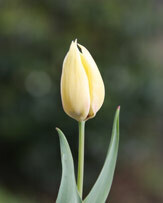 As the flowers grow from a pseudo bulb, the older bulbs will die eventually and will be replaced by a new one. When repotting, remove as much of the soil as possible without damaging the roots or the bulbs. Remove the old dead bulb and give the roots a little trim. They are now ready to be replanted. 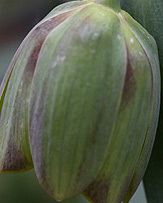 You will notice some bulbils (small bulbs), these can be planted along with the new main bulb. They will eventually (after 3 - 5 years) form new plants. 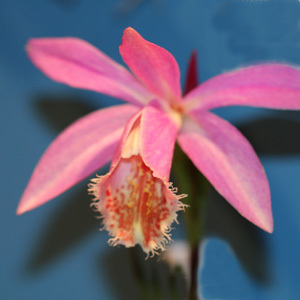 Pleione Orchids are readily available for sale online from specialist growers. One of the cultivars that has been around for a while is Pleione tongariro (pictured below right), deep rich pink flowers, excellent when planted in a clump im a large bowl. 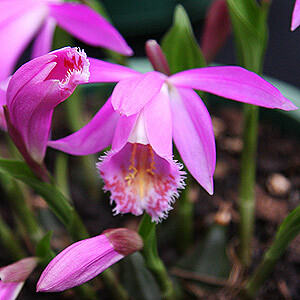 You may also find some Pleione plants for sale at orchid shows, well worth a look. As for common names, how about "Peacock Orchid ", "Glory of the East", "Windowsill orchid", "Indian crocus" or "Himalayan crocus". 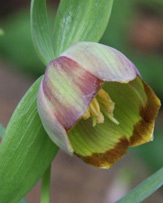 Keep with the botanical , Pleione and people will know what you are talking about.